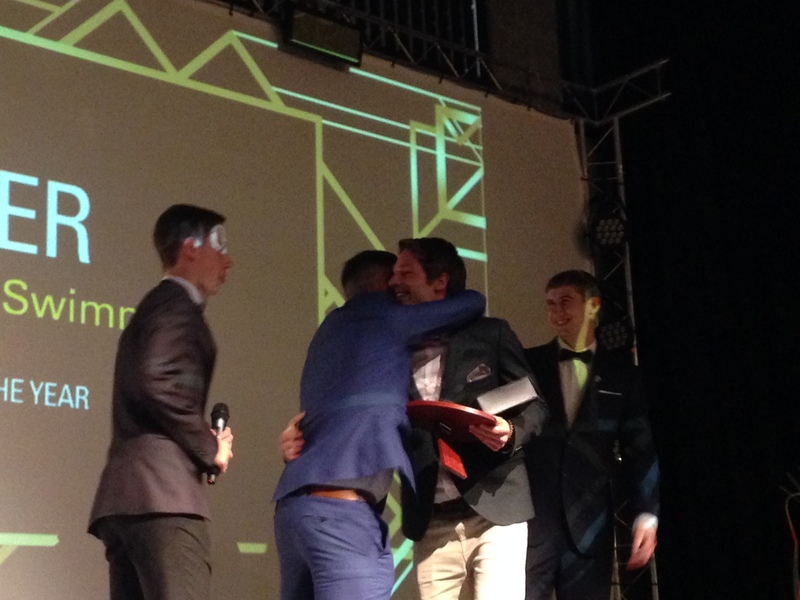 Rio hopeful and swimming superstar Martin Schweizer has been awarded Sports Person of the Year at MMU’s Sports Awards Ball. The multiple Swiss record holder was presented with his award at the annual event at MMU’s student union on Wednesday 25th May. Martin, 27, faced stiff competition from fellow Manchester Thunder’s Gabby Marshall, Manchester Giant Jerelle Okoro and Commonwealth Games track cyclist Ellie Richardson. Martin, who is graduating this summer, was incredibly pleased to win the award.“This is a really nice finish to my MMU career,” he said. Martin will spend the next couple of months concentrating on Olympic qualification. If that task wasn’t enough, Martin has had to balance being an elite athlete and completing his BA in International Business and Marketing. Martin says the balance has been worth striking. “I dream about qualifying for the Olympics,” he said. “I’ve had a really busy time at university but I’m positive. Martin, who specialises in 50m and 100m breaststroke, is very grateful to the support his MMU Sport scholar has provided him with. “My best year in swimming, breakthrough year at international level in my first and second year. All four shortlisted for the award are recipients of MMU Sport’s scholarship and MMU Sport’s Performance Sport Officer Callum Jones praised his hard work. “We are really pleased for Martin,” he said. “He has been a huge asset to the university throughout his three years at MMU and a very committed and successful scholar for MMU, in BUCS championships and winning numerous medals. “Martin has been pleasure to work with this year and everyone at MMU Sport wishes him great success in his future endeavours. Martin will face his final chance to qualify for Rio in the Summer Swiss National Championships between July 1st and 3rd. Previous You’ve won a tonne of stuff!